Nepal’s young cricketers have already left for Malaysia for the ICC U-19 World Cup Cricket Asia Qualifier taking place in Malaysia from Friday. Nepal will lock horns with the hosts Malaysia, UAE, Singapore, Kuwait and Oman, eyeing the overall victory so as to open the door to the World Cup to be held next year. Nepal national cricket team’s reliable middle order batsman Rohit Kumar Paudel is skippering the U19 team for the first time. 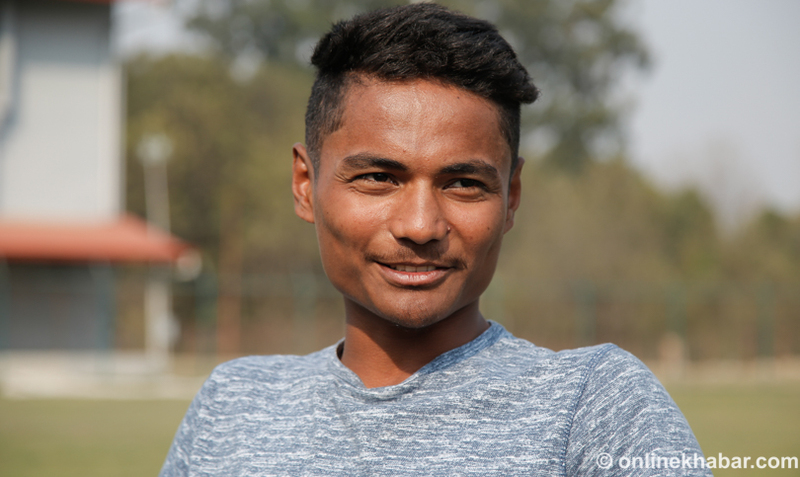 In this context, Onlinekhabar has talked to Paudel, on the possibility of winning the qualifier. You are playing as the captain for the first time. What is the difference between a captain and a player? You have greater responsibilities as a captain. He plays a key role to take the team forward. He has to think of every aspect, like how batsmen can make better scores and how bowlers can coordinate to ensure a victory. In this new responsibility, I am focused on making the players free of stress. The better I can do, the better my team performs. Are you confident of taking Nepal to the World Cup under your captaincy? Four members of our team also play for the national team, but all of us are experienced. We have been playing together for past two to three years. Therefore, I am confident that we will win the regional qualifier and qualify for the World Cup. We have a great opportunity under my captaincy. I am determined to utilise it properly. I cannot miss this chance. Which team are your biggest threats? All teams are equal. But, we have perceived that the UAE are the strongest. They have made some changes in the team formation. They scored 270 runs against us in a match played in Bangladesh. They are our biggest threats, but we can defeat them. We have improved some of our weaknesses of late. All the players are confident. Your arch rivals were Afghanistan, but they are not playing the qualifier this time. Hence it must be easy for Nepal to qualify. We used to lose to Afghanistan because we did not have much experience and preparations then. But, we have prepared for the tournament quite well. Since the last edition of Dhangadhi Premier League, we have been playing regularly. All of us are in a good form. We will play for the victory. Recently, your team visited India for preparations. Did that help you anyway? We stayed in India in 15 days and played six good matches. We played with good teams. Some of our players are new and I believe the India trip helped them effectively. We played in a different climate. Now, the players are used to that temperature, which is almost same in Malaysia. One of our intentions was to get familiar with the climate and weather. All the players have performed well in the preparations. You mean the team are stronger than early days now? I think the team are more balanced now. In the past, we had only two players who played for the senior team: Dipendra Singh Airee and Sandeep Lamichhane. Now, we have four national players. It means we are stronger now. What is your expectations from the new players? We have four new players. All of them have performed well in their matches. I expect a lot from them. They can play decisive roles in the team’s victory. Nepali cricket’s major problem has been batting in all age groups. How much have you improved? We have improved in both batting and bowling. Our players are all rounders, some of them are fast bowlers like Kamal Singh Airee and Rashid Khan. Likewise, there are spinners like Sagar Dhakal, Surya Lama and Pawan Sarraf. Let’s see how they will play in the ground. What factors assure you that Nepal will qualify for the World Cup? The first is batting. If our batsmen play their roles, we can make good scores. It makes the bowlers easy. The India trip has boosted the confidence of our batsmen. Top and middle order batsmen can score a century each.